This is a quick and easy side dish for Thanksgiving. After a bit of prep work, the dish tuck into an unused corner of the oven and is ready to go in no time. You want to start with small beets -- think golf balls not softballs. The dish is more fun if you can find two varieties of beets. I use a yellow and a red. 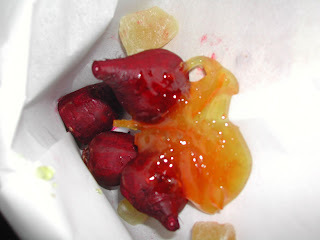 With two varieties, however, you must cook them in separate parcels as the darker beets will color the lighter ones. With small beets, you will need to cut the green tops as close to the beet as possible. With a small paring knife, simply scrap the skin off the beets. BE WARNED, beets will stain your hands, so wear gloves. This recipe calls for yuzu honey, sometimes called citron preserves. If you can't find yuzu honey, substitute a mix of half orange marmalade and half honey. Place the ingredients on a sheet of parchment paper. 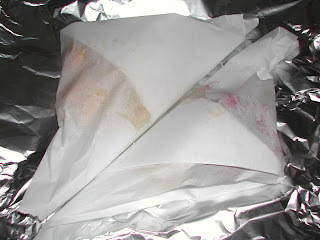 Wrap the ingredients in the parchment paper and then wrap the parchment paper in aluminum foil. 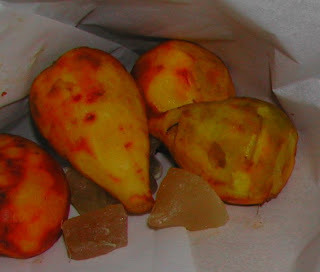 With these on the table you can skip desert!